JACK: Why are you two just standing there, talking? Can't you see I want to play tag? 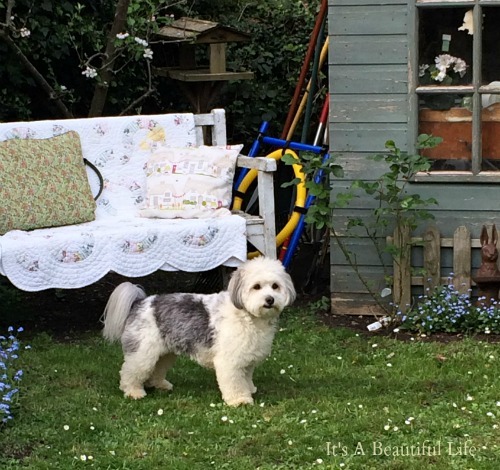 I look around with a happy sigh as I stand in the middle of my host's pretty garden. Hidden behind tall brick walls, Carrie and I step into a lovely bit of 'heaven' where spring blooms in every corner. 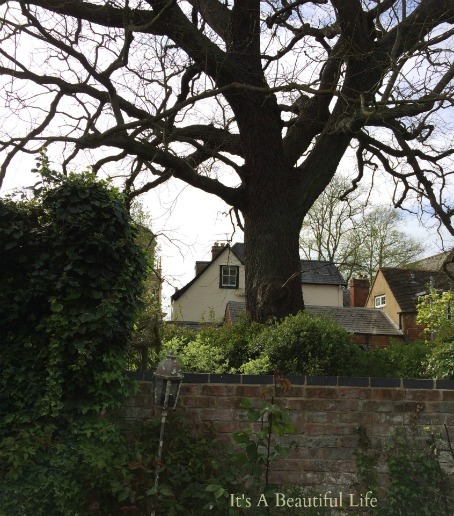 A sanctuary in the middle of town, it seems a place where quiet, peaceful activity can unfold: I imagine a bit of gardening, feeding the hens who would lay next day's breakfast eggs, perhaps reading a good book with tea, or just having a sit down in a ray of sunshine. For the time being, Jack quietly sniffs out his favourite spots, waiting for a timely moment to interrupt his chatting companions so he could get on with what he considered the real reason why we all came out here -- to play 'catch me if you can' tag. A huge leafless tree looms overhead. Carrie calls it the 'Lewis' tree, as it's the one C.S. Lewis would have seen from that upstairs window in the white house when he arrived in Oxford for the first time in 1916. You might be surprised - or not - to learn I felt a certain thrill in actually seeing this spot with my own eyes, and to gaze up at the same tree, not to mention the window of the room where he once looked out. The man, known to his friends as Jack, became a favourite author of mine ever since I discovered his writings in my late teens/early twenties, at which time I devoured everything I could find of his, including the Narnia stories. Aside: Do you ever think we humans are a funny lot, going on 'tours' to catch glimpses of where our favourite well-known persons once studied, lived, wrote their famous books or songs... or whatever else? Have you ever wondered why we want to do that? Is it our way of connecting with history and the people who left footprints in the sands of time for us to notice? What do you feel about it? And, another thing, have you ever wondered what they might think of it all, if they knew, since many of them were probably just minding their own business living out their lives, just as we are doing today? Whatever it is, somehow our veneration of them adds something meaningful to our own lives. "My first taste of Oxford was comical enough. I had made no arrangements about quarters and, having no more luggage than I could carry in my hand, I sallied out of the railway station on foot to find either a lodging-house or a cheap hotel; all agog for “dreaming spires” and “last enchantments.” My first disappointment at what I saw could be dealt with. Towns always show their worst face to the railway. But as I walked on and on I became more bewildered. Could this succession of mean shops really be Oxford? But I still went on, always expecting the next turn to reveal the beauties, and reflecting that it was a much larger town than I had been led to suppose. 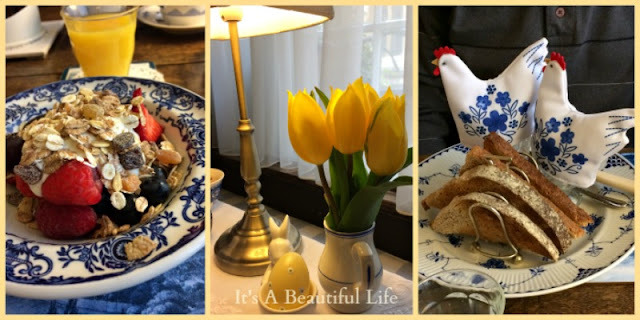 Soft jingle bells on the door announce our arrival into the cozy breakfast room -- bells on the right, two photos up -- where we found the buffet set with inviting bowls of fresh berries, organic yogurt (so creamy), and granola mixed with dried fruit and nuts. 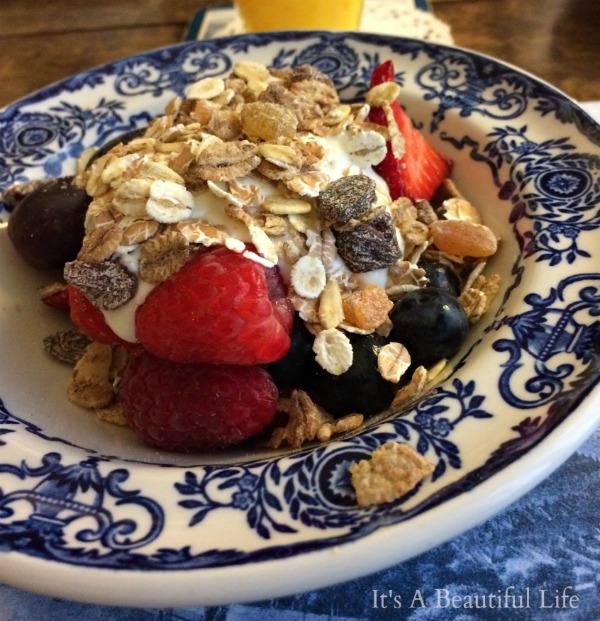 We tucked into the berries and yogurt while our hot breakfast selection for that morning was being prepared for us. 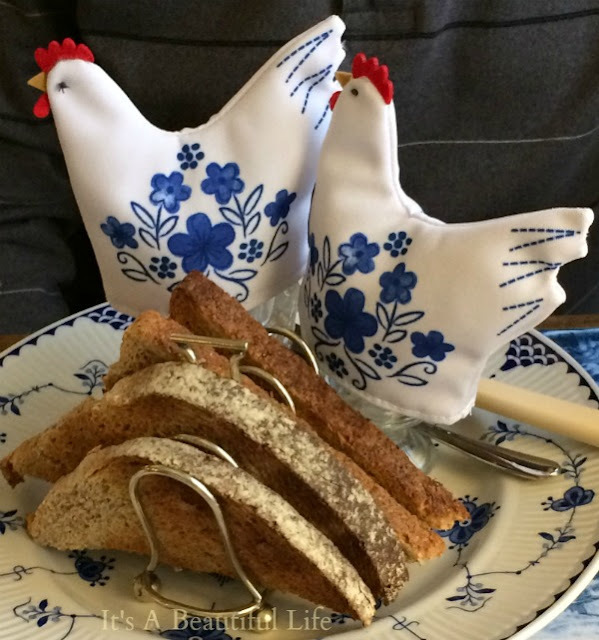 Rick ordered boiled eggs and toast our first morning... and they arrived nestled under those darling hen 'tea cozies'. For sure, we needed a photo of them. 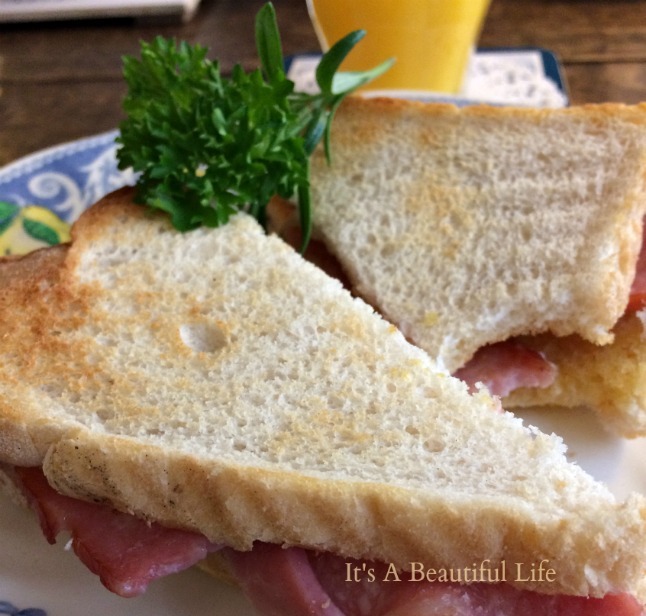 As for me, I had the yummy bacon sandwich. If anyone recalls me reading Lucy Dillon novels, as noted in a distant post, one story involved a rescue dog shelter. When volunteers came to walk the dogs, they were later rewarded with homemade bacon sandwiches which the owner of the shelter made herself. I thought, yum, so when I saw it listed on the menu, I knew what I wanted. 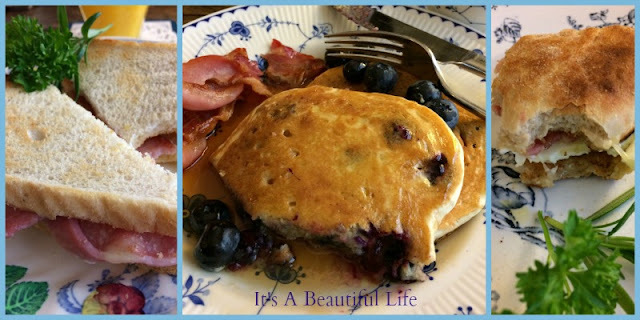 Other mornings, I had the sumptuous Blueberry Pancakes with maple syrup, and Carrie's delicious version of the Egg McMuffin. It was all wonderful with cups of tea or coffee and fresh orange juice. Appetites satisfied, we gathered guide maps, cameras, and headed out in comfy shoes and warmish jackets. Still early morning, the streets were quiet, and there was a sense of wonder as we strolled. To think we were walking on paved or cobbled streets, seeing in person the colleges and buildings that have been standing here in these very spots for hundreds of years. The Radcliffe Camera in Oxford (centre above). We could only view this impressive circular building from the outside. It is a working library, and so only students and scholars are admitted. I took this photo from the tower (left) when we climbed up. Designed by James Gibbs and built in 1737 to 1749, the Radcliffe Camera forms part of the Bodleian Library complex and houses mainly English, History, and Theology books. Oh, to be a fly on those walls for a reverent peek inside. 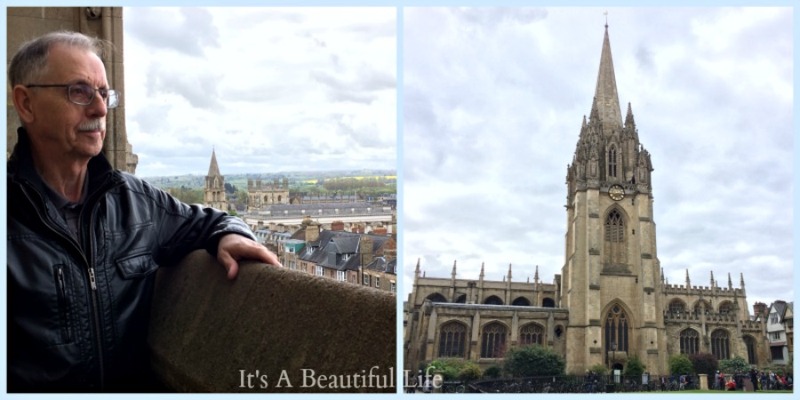 The University Church of St Mary the Virgin (left above) sits just opposite the Radcliffe Camera building. That soaring 13th century tower caught our attention; for a small fee, we could climb to the top of the spire and enjoy a bird's eye view of Oxford’s famous ‘dreaming spires’. So, climb we did -- 127 steps. Those nice wooden stairs you see in the photo were just near the bottom; as we got inside the tower--the very narrow tower--we found ourselves treading carefully on extremely narrow stone steps. Round and round the stairwell went. Up, up, up. Thinking to myself, good thing we aren't experiencing any claustrophobic feelings in this moment. I longed to stop for a photo but people were pressing in behind, so I kept climbing ... until we reached the top, where after I caught my breath, we stepped out onto a very skinny walkway (they certainly didn't build with tourists in mind all those centuries earlier--wink). It was not wide enough for adults to pass each other, not even a tiny toddler, although one tried to wiggle past my legs, to his mother's deep chagrin. The view, the view. A spectacular sea of stone and brick, all put together with such architectural beauty and design. I understand Headington stone, a limestone from the Headington Quarry area near Oxford, was traditionally used for a number of the older Oxford University college buildings. 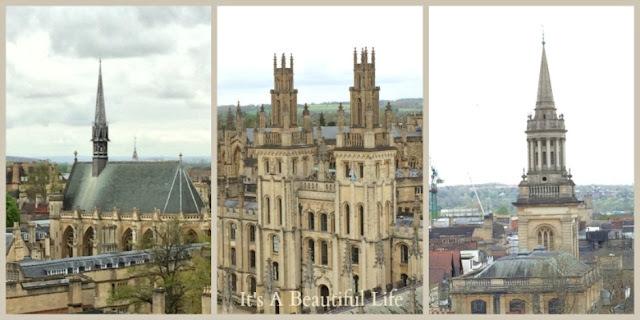 Oh, look, there they are -- the famous spires and towers standing like sentinels against the Oxford skies. And, here we are in person, looking at it all. What is it about this place that captures the imaginations of people everywhere? Poets, writers, artists, historians, architects, scholars, readers, teachers, nobodies, somebodies, young, old -- we've all been bitten. I am smitten. 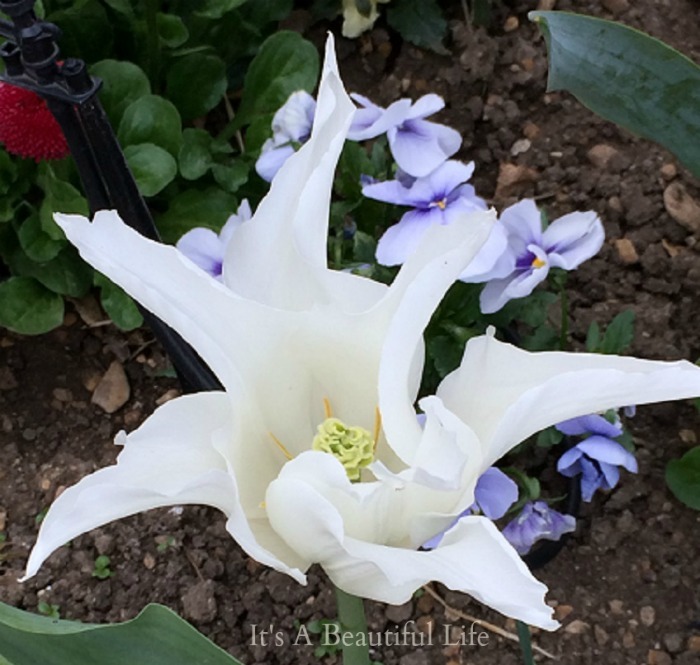 She needs not June for beauty’s heightening." "Oxford through mist from the Thames at Port Meadow"
We had the privilege to meet another local artist, Joshua Hughes, an Oxford fellow and a man of many talents. 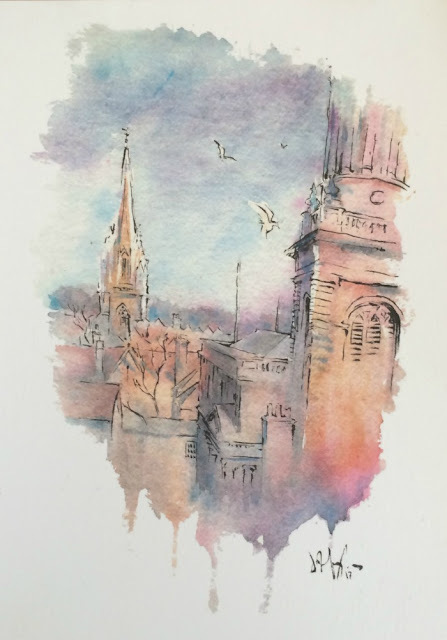 He had a display of some of his work in The Radcliffe Camera square one morning, and it didn't take us long to know which water colours we wanted to bring home as keepsakes of our time in Oxford. You can find Josh's website here. What fun to go on one of Stuart's walking tours. 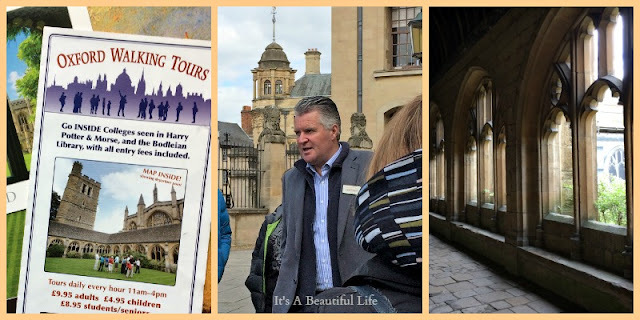 "Oxford Walking Tours has been operating from the blue gates of Trinity College on Broad St for more than 30 years." And, Stuart has been a part of that tradition for as many years, being an Oxford man himself. He pointed out to our group the well-known buildings and shared so many interesting bits of history about the City and University of Oxford. If you wonder why the colleges are all cloistered behind walls that don't permit the public, that tradition goes back a long way. It started in the early days of the university. The local townsfolk were not happy campers when privileged students came to study in their neck of the woods. Altercations between them happened often; students were even murdered. So walls and gates that were locked at night were built to help protect the students. 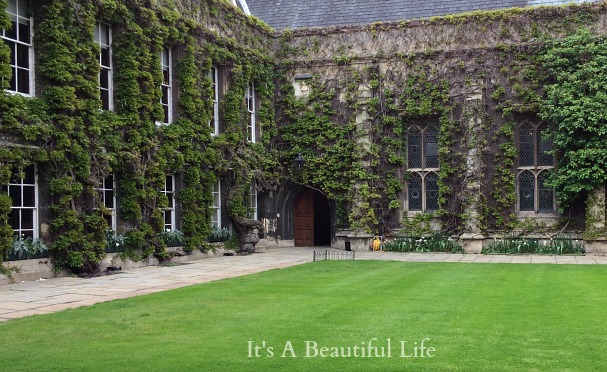 Nowadays it's not about murder, but the tradition of walls and gates remain -- let the students and scholars get on with their work in the sheltered environment of their own colleges. When the colleges are on term break, visitors are permitted to visit the various college grounds and buildings. Snoopy people like us rejoice. 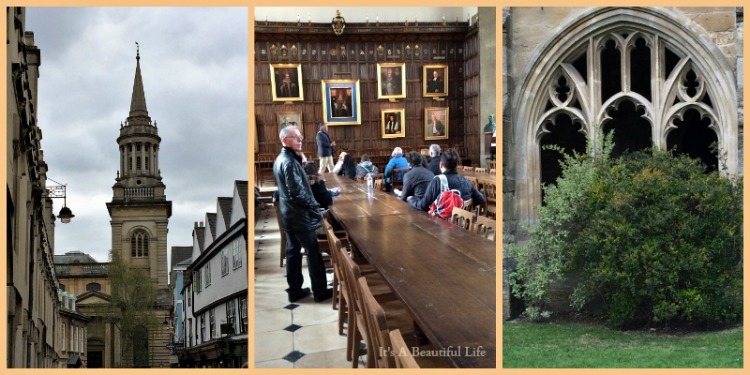 Stuart took us through New College's cloisters, gardens, the impressive dining hall with those long wooden tables (made famous by films such as Harry Potter, Brideshead Revisted, and others), the beautiful chapel (no pics allowed there). 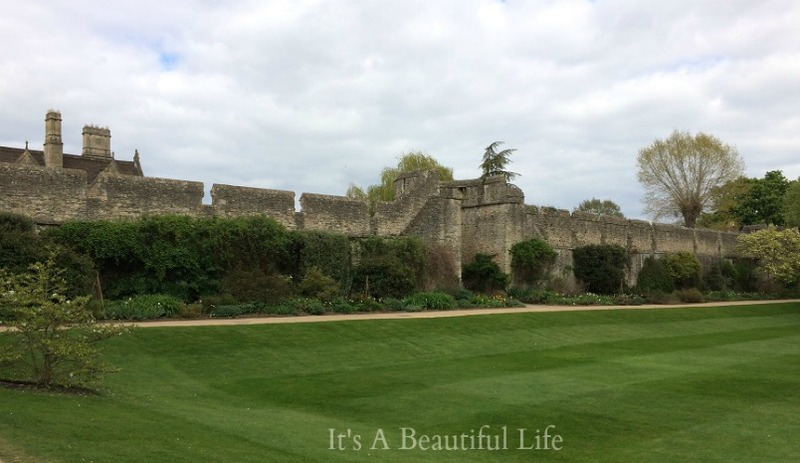 While we were walking through the beautiful gardens of New College (above), the birds were serenading us so sweetly, I tried to capture the sound on video. It was windy so it rattles too. I shall stop here ... for surely you need a break and your teacup is now sipped dry. I'll begin the next post right away, and, for all you book lovers, I'll be absolutely sure to include Blackwells book store and the lovely books I found there, as well as notes about the very stirring Easter performance of Mozart's Requiem we heard in the Sheldonian Theatre and how it stood out as one of those 'complete' spiritual moments. I hope you've enjoyed my joy ride in a dreamy Oxford bubble! Lovely, lovely! What a sweetheart of a puppy, I want a Jack of my own:) I do believe in the power of place, perhaps that does help explain why we are drawn to places we've never been before. Except now you have been! 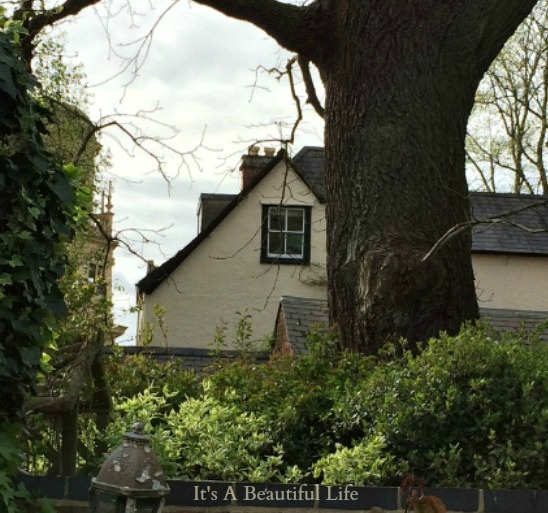 Thanks for sharing your wonderful photos and experiences with us! 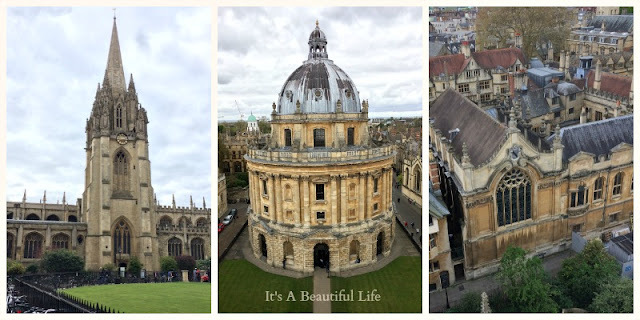 I long to visit Oxford one day! Thank you for sharing your wonderful trip with us! Absolutely fabulous! I thoroughly enjoyed you taking me on a tour. Loved every single word and photo. And, I so enjoyed breakfast. Truly, lovely Bren - you should write a book about the experience. I know through your eyes and with your words, it would be a piece to treasure. Oh Brenda, you brought back such memories of my early days near Oxford. I'm so glad you had such a fulfilling visit, music,tours, walks, and all those steps too! Again, a wonderful and lovey post! Your pictures just capture me. I got goosebumps when I read about C.S. Lewis and the treeless tree! That is almost worth the whole trip! 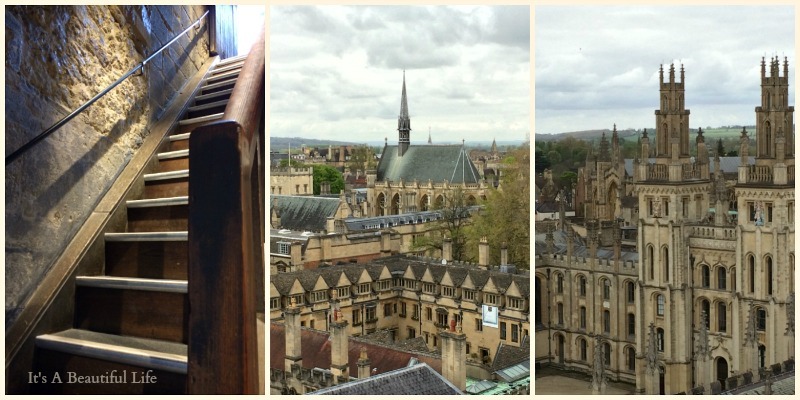 But the History of Oxford and all the Architecture, amazing! 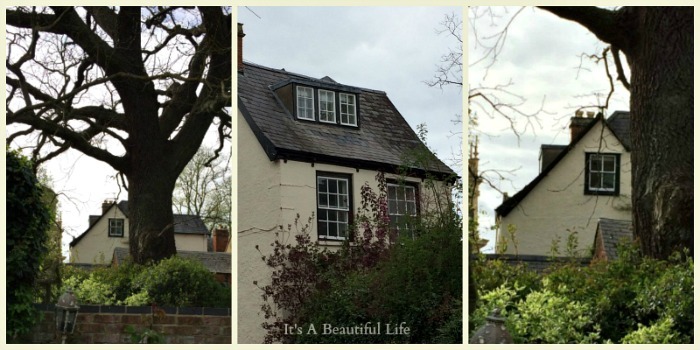 Brenda, your posts on Oxford and your B& B, just gives me shivers with delight! Another wonderful tour! You can give Rick Steves a run for his money. I've had this post in my feed for several days, and waited until I could give it my full attention. It was well worth the wait. 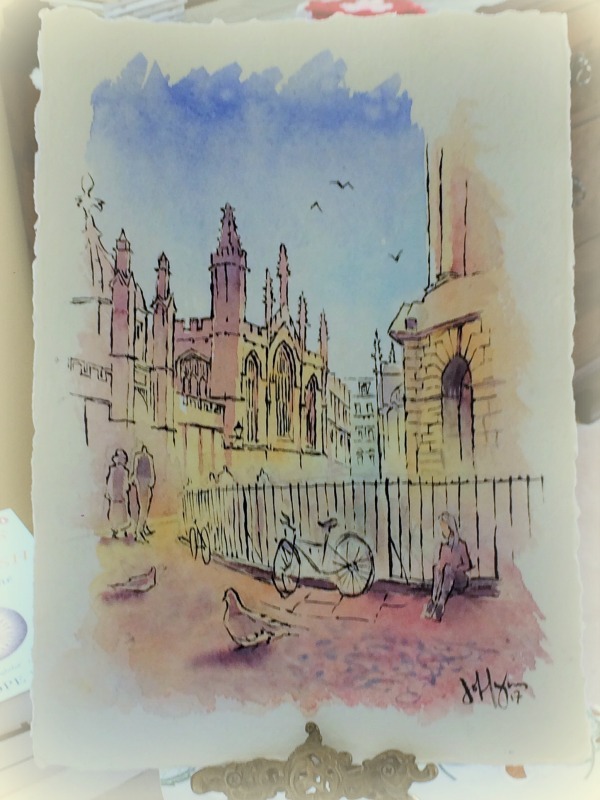 I'd love to visit Oxford one day, too, the scene of so much literature and history. About our desire to connect with figures from the past, I'm still pondering the question and appreciate Vee's inclusion of Lewis' comment. 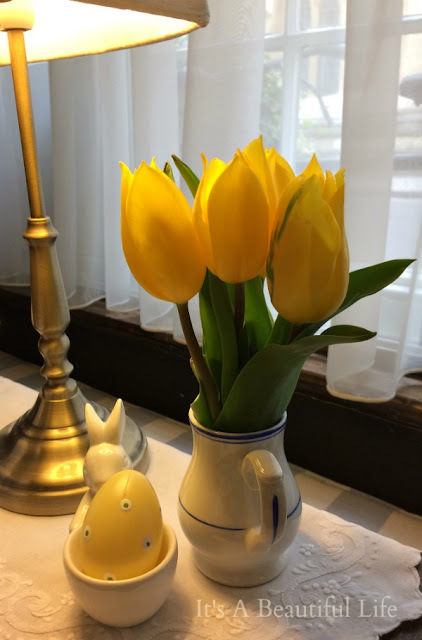 I think that when a story from the past touches us, in a variety of ways, we want to somehow connect with that story, be it historical or fiction. Our lives are made up of stories. Now, I'm off to investigate why the Bridge of Sighs is so-called. 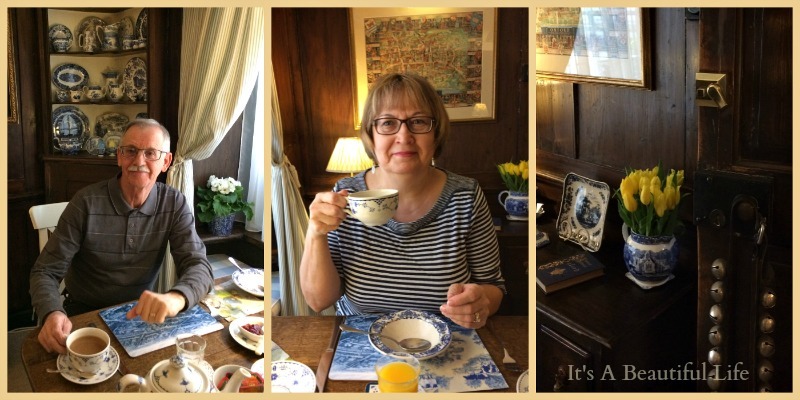 Thank you for this delightful read (and the delicious breakfast descriptions and photos). Such a wonderful post! I enjoyed coming along with you, from the sweet garden with Jack, to the amazing tree once gazed upon by C.S. 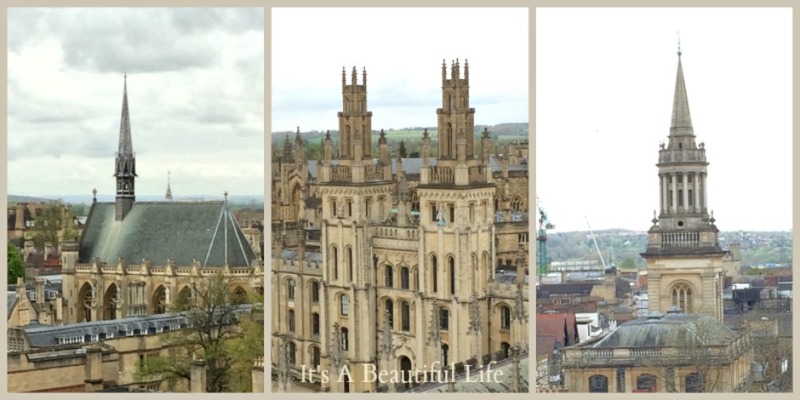 Lewis, the delicious breakfast, and on to the beautiful village of Oxford and those incredible spires in every view. I see the forget-me-not are blooming in the garden, and I love the hand-stitched egg cozies. My father, who's mother's ancestors were English, always loved bacon sandwiches and my mother would make them for him every Sunday morning. 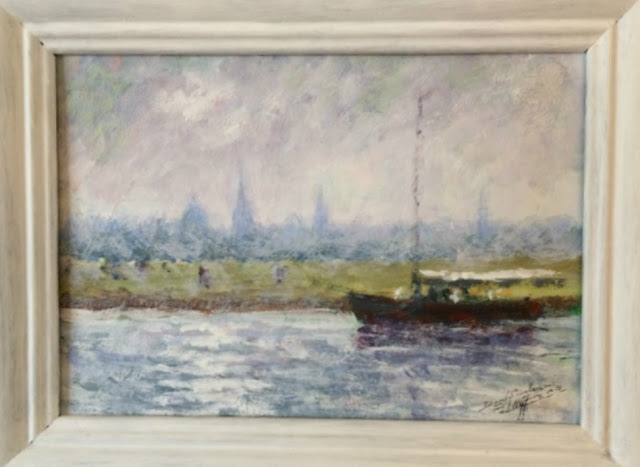 I love the painting that you bought, and the watercolors, too. I think the desire to experience where our favorite authors, artists, etc. lived, is to understand where they found their inspiration and to imagine history in the making, as we retrace their very footsteps. 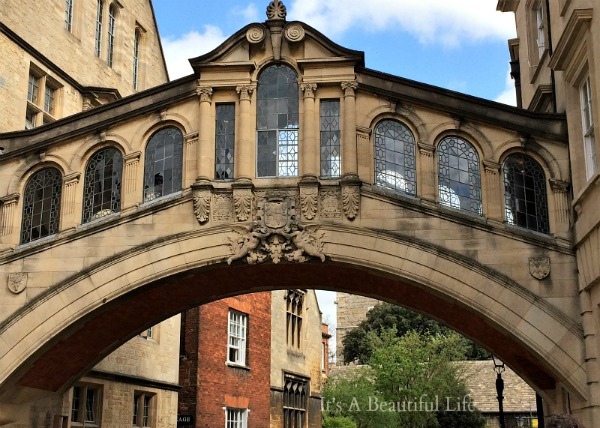 The bridge of sighs is certainly sigh-worthy. Thank you for taking us along! Just breath taking. Thank you, thank you for a beautiful tour. A smashing post, Brenda! 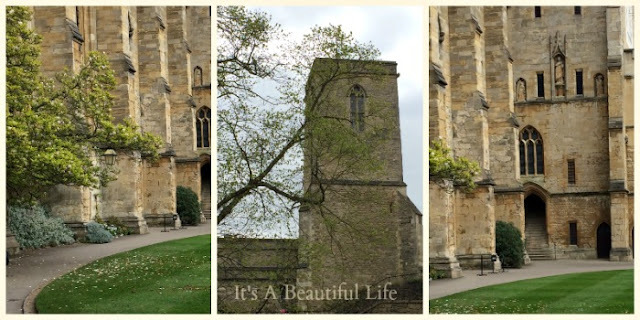 I'm so enjoying following your Oxford adventures, they have such old-world charm, like a Father Brown mystery only without the bodies (unless there is a part 3?). Wow! Thank you for sharing. I really enjoy reading your posts. My first time to comment :-) Looking forward for your next.